Society is constantly impacted and changed by rapid developments in Information and Communications Technology (ICT). This requires of people to have the skill and ability to respond to these changes and to utilise ICT as an enabler - whether it is to facilitate socio-economic development, education, health or simply to live the lives we value. This skill (e-skills) is so important that many countries regard it as a basic human right. So what is being done about this shortcoming? Obviously more CAT must be taught at schools to rectify the situation. Doing revision of old exam paper with the software used in the examinations is crucial. For the last few weeks I have been using iPad Notes and occasionally using Open Office Word in a different language. Today I have had to use advanced Microsoft Word features. Oops. I have forgotten so much. It came back but revision using the correct software is crucial. My experience is that we have a long way to go in developing problem solving skills. To prepare for the Applications Olympiad one should go over old papers. http://www.olympiad.org.za/past-papers/programming-round-2/ This links to all old papers. Think of the prizes. Going over these old papers will assist in preparing for the Matric final examinations. No, the data is not there but the question papers are. 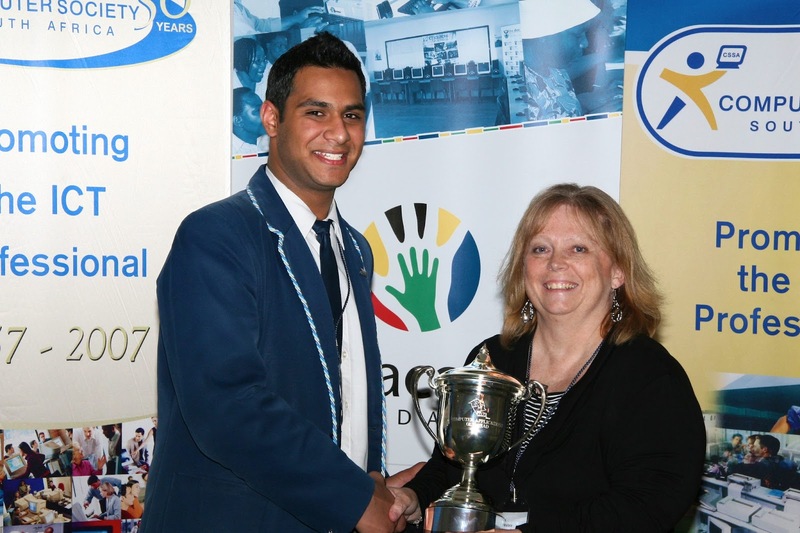 Altogether 13 000 high school learners entered this year's CA Olympiad, doubling the 2010 figure. This year's Applications Olympiad finalists were very representative of the country – coming from six of the nine provinces. Unlike in the past when the Western Cape and girls dominated the Finals, this year there were no finalists from the Western Cape. First place went to Ziyaad Seedat, a Grade 12 learner at the Ligbron Academy of Technology in Ermelo, Mpumalanga. Apart from winning a gold medal and the prestigious CoZa Cares Trophy, he also won a scholarship to the University of Cape Town, an Apple iPad and R3 000 prize money. While most of the participants are heading for studies that will lead them into the IT world, Ziyaad is unusual in that he intends to study medicine next year – at the University of Cape Town. Silver medals went to Salomè Bloem, a Grade 12 learner at the Hoër Volkskool in Potchefstroom, North West Province and Michael Harrison of Grade 12 at Michaelhouse in KwaZulu-Natal. Michael will study Computer Science at UCT next year, while Salomè will go to the North West University to become a chartered accountant. Bronze medals went to Lwandle Makhoba, a Grade 11 learner at Horizon High School in Johannesburg, Thiolan Naidoo, also a Grade 11 learner, at the Star College in Durban, and Mpumelelo Sibiya of the Ligbron Academy of Technology in Ermelo, Mpumalanga. Congratulations to the winners! The prizes make this a worthwhile competition to enter. Just reaching the finals is an achievement. The contestants were flown to Cape Town and spent 3 nights at a guest house near the venue of the prize giving awards dinner. On the first day of the contest they answered Olympiad style questions. On the second day they were taken on a tour of the Peninsula on a Red Bus and visited the Two Oceans Aquarium and the Waterfront. That evening they attended the prize giving award dinner at Kelvin Grove. I suggest that CAT teachers start preparing their learners now to enter this prestigious competition. The prizes may be different next year but WOW, this year's winner really went home financially better off than when he arrived. Go over the work of all the grades. 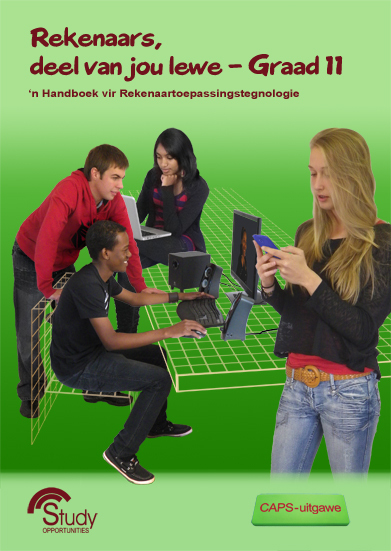 Look at the front covers of the Gr 11 CAPS book for CAT. The models look good. The contents of the book is even better. CAT teaches these skills – using the computer to solve problems; logically organise and analyse data; automate solutions through a series of steps; and all the steps above. These skills do not only relate to computers but to life and all subject areas in the school. These are characteristics essential in today’s world. Those who do not do not become fluent with the computer do learn these attitudes / characteristics. Look at this list – is this not what is encouraged in the activities in the Gr 10 and 11 CAPS CAT books from Study Opportunities, particularly at the end of modules and towards the back of the book. To develop computational thinking and associated attitudes the learners must learn to use the computer to solve problems. Subject choice is taking place in many schools now. Encourage learners to take CAT or IT as in the world of expanding knowledge and changing economies learners must learn computational thinking (the problem-solving process) and develop the associated attitudes. In every school try and break the digital divide and encourage computational thinking via ICT use. The word 'with' in Question 3.3.1 should be 'without'. When the Gr 10 learners get their practical question paper, they must first read it during the reading time. Then they must get a pencil and make notes on the question paper. They must look at every question and see how many 'questions' are actually asked in each numbered question. It is very easy to miss parts of a question. One of the interesting consequences of the CAPS document is that every school has to do the same work in every term in a particular subject and grade. This means that every school can now very easily swop/buy/get quality papers, knowing that the work covered in every paper would correlate with the work which was meant to be taught, or can set their own exam papers. I do not believe a 'single' person can set a quality paper, covering all the required content, on a meaningful theme, at the correct cognitive levels. These thoughts came to me after perceiving the dreadful stress levels of teachers, listening to subject advisors discussing the exam requirements in their districts and the job of moderation of exam papers, and looking at the wonderful CAT papers set by Study Opportunities. In the end smart teachers must do what they have to do. Setting exam papers is a challenge, especially when time is short. Firstly do not tell your learners how you are setting/getting your papers as it is actually not their business. Set your paper on work you have done, not work you should have done. Get reputable old exam papers from, for example, Study Opportunities, the Department of Education, etc. Take questions out of a mix of them and then adapt the theme to one common theme. If learners have seen and worked through old exam papers, some of which you have chosen in your mix, well so be it. They learned by doing the old papers which is not wrong. Create a teacher group and set the papers together in an afternoon, all together. Keep the names of the participants in the group private so that if one teacher's learners write before another, there can be no leakages. Decide on a topic before the meeting and who will be creating the questions using particular applications and which features. Bring samples of the pre developed questions to the group meeting for putting the paper together. Create a teacher group and plan who is going to set a particular paper during the course of the year, and divide the work load up. If one of the group does not fulfil his/her obligation, never share with them ever again, nothing! Buy a new paper from a reputable source such as Study Opportunities if they set them that year. Start your year with an idea or theme for an exam paper and develop it during the year. I have created some great papers when I have had time to develop them. If you get a paper from a source, personalise it with your own header/footer and title page. When your paper is ready, do it yourself a number of times ironing out hiccups so that when the learners get it, it is problem free. Mark the work yourself before the time, to check your memo. When working on a 'funny' network, do an old paper with your learners in the laboratory where they are going to work, just checking that all the required features are functioning. There is more to life than setting exam papers. Do it smartly and save time so that you can have a life! I used this quiz when teaching formatting and selecting fields in Access reports. The students had to work in pairs doing the quiz until they achieved 100%. Try it online or download, unzip and use on the network. Have fun. Let me know how it goes.